Portable Beer Pong Table - Indoor Outdoor Folding Beer Pong Camping Table- Regulation Size w Cup Holders, 6 Balls, Ground Stakes and Carrying Bag: Now you can bring the party with you! 6 ground stakes keep the fun going outdoors in lawn or sand, and extra cup holders keep the spectators comfortable, too. Made of 100% woven polyester oxford fabric for easy storing and carrying. Beer Pong Table - Regulation size collapsible table for easy storage. Portable beer pong table with carrying travel bag, ground stakes and pong balls. 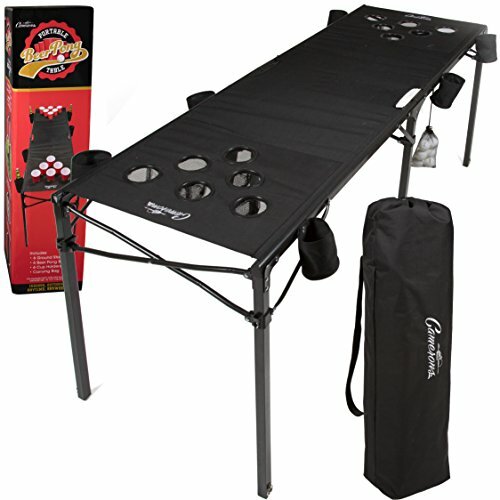 Folding Beer Pong Table - Includes player cup holders and 6 additional cup holders for spectator drinks. All in one set so you can bring the party with you! Perfect for indoors or outdoors at the beach, tailgate, or backyard! If you have any questions about this product by Camerons, contact us by completing and submitting the form below. If you are looking for a specif part number, please include it with your message.